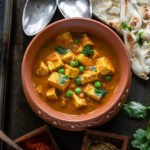 Instant Pot Aloo Matar – easy potato and green peas Indian curry for weekdays, made with basic ingredients. Vegan & gluten-free. This recipe comes together quickly and needs very basic ingredients so personally for me its one of those recipes that I make when I don’t know what else to make! If you love all the Instant Pot vegetarian/vegan recipes that I share on the blog, please join me on this Facebook Group – Instant Pot Vegetarian Recipes. The group would share/feature vegetarian instant pot recipes and ideas from all around the web! I am so overwhelmed with lot of things right now. Like, we are going to Europe next month (I can hardly wait!) and we spend all our weekend and free time planning for the trip. It’s funny though that I lived in Scotland for 1.5 years and never went to Europe. I think when you are a student things are so different and you really don’t have any money to go on a vacation. Anyway better late than never! This is going to be my first time in Europe and I am so looking forward to this trip! Do you guys have any recommendation of places to eat in Paris, Lucerne, Amesterdam? I would love to know! 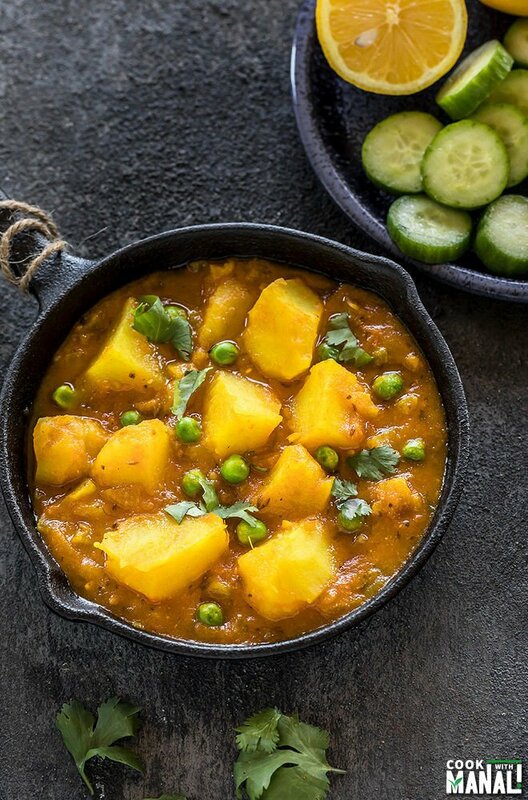 I am resorting to easy meals these days and it can’t get easier than this Instant Pot Aloo Matar [Aloo=Potatoes and Matar=Green Peas]. 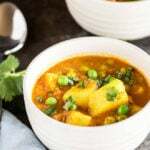 This recipe has just potatoes, green peas, onion, tomatoes and a few basic Indian spices. It really can’t get more basic than this. 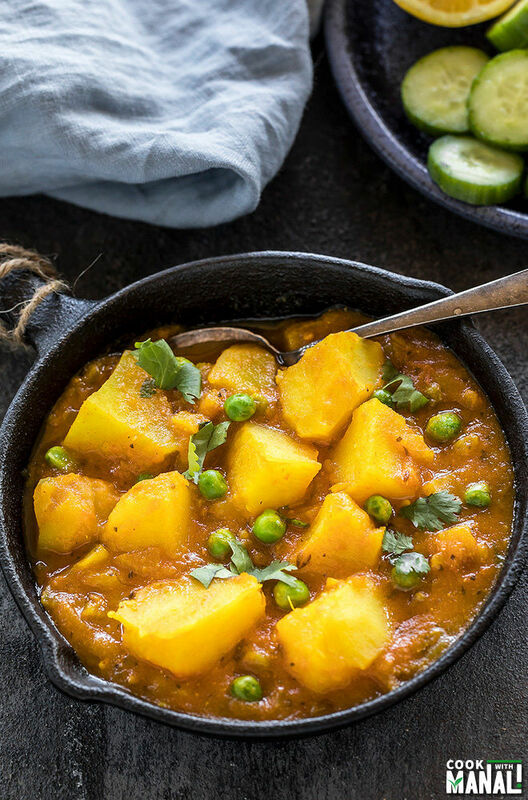 Potatoes are used in tons of Indian recipes and often paired with any other vegetable that you can imagine like cauliflower in aloo gobi or spinach or beans! 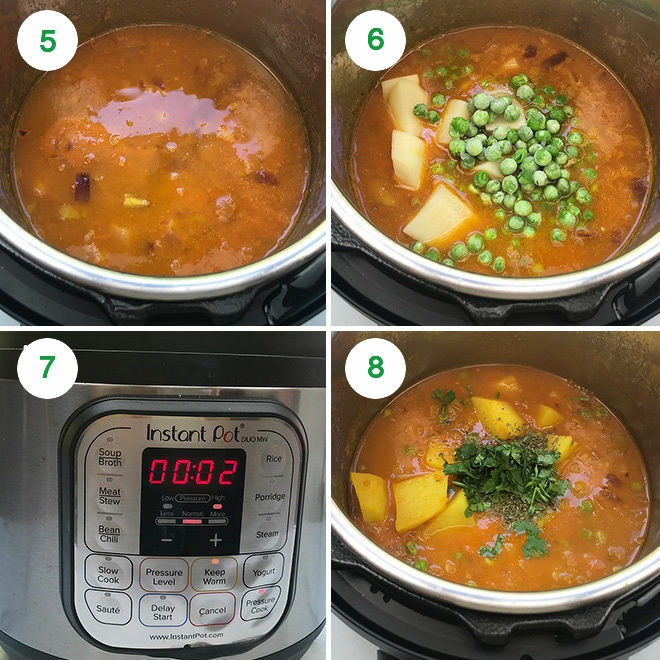 For this instant pot aloo matar recipe potatoes are cooked with green peas in an onion tomato masala. 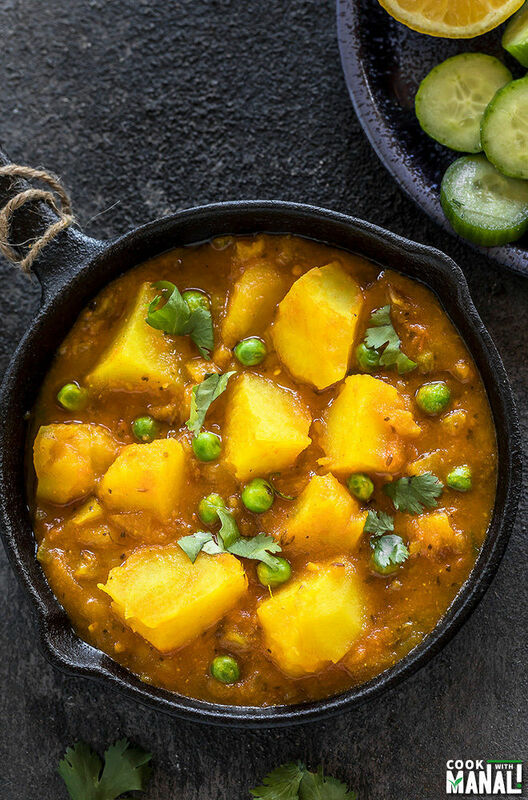 I already have a aloo matar recipe on the blog but this in the Instant Pot version. I remember in my home potatoes were one vegetable which everyone would eat. Whenever mom made a vegetable like say spinach or eggplant which half of the people won’t eat, she made sure to make some potatoes along with so that those who wouldn’t eat the spinach or eggplant could at least eat something! And everyone would happily gobble up the potatoes. I always wonder what’s so magical about them? 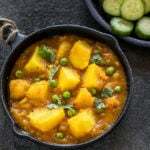 So, if you are also a potato lover, then you must try this aloo matar recipe. It’s lightly spiced, makes great meal when paired with roti and is really comforting. I cooked the potatoes for 2 minutes on high pressure for this recipe and they were well done and yet retained their shape and texture. TIP: Make sure to chop the potatoes into large pieces, around 1 to 1.5 inch pieces. If you chop them small, they will get really mushy and dissolve in the curry. Using a blender, puree the tomatoes with ginger and set it aside. 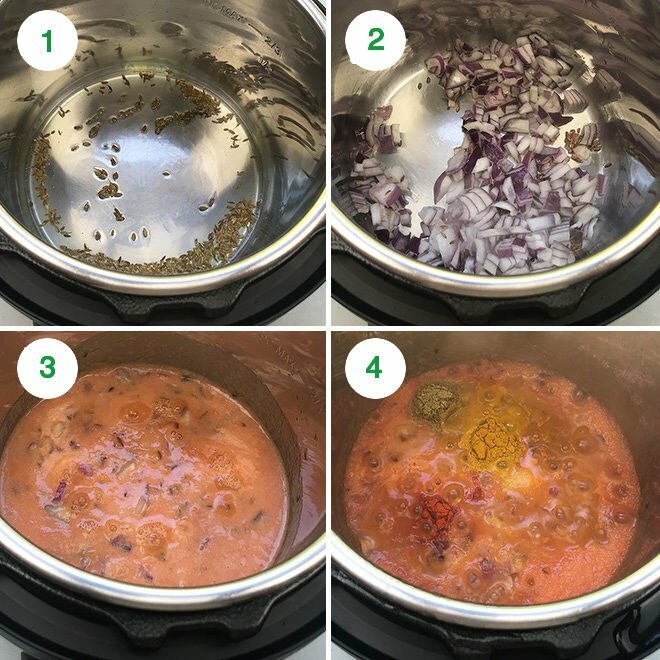 1- Press the saute button on your Instant Pot. Once it displays hot, add oil to it and then add the cumin seeds and let them sizzle for few seconds. 2- Add the chopped onion and saute for 2 to 3 minutes until the onions are soft. 3- Stir in the pureed tomatoes to the pot and mix. Cover the pot with a glass lid and cook the tomatoes for 3 to 4 minutes. 4- Add coriander powder, turmeric powder, red chili powder and salt. Mix well and cook the spices for 30 seconds. 5- Add water and mix. 6- Then add the diced potatoes and frozen green peas. 7- Stir and close the pot with its lid. Press the manual or pressure cook button and cook on high pressure for 2 minutes, with the pressure valve in the sealing position. 8- Do a quick pressure release. Open the pot, add crushed kasuri methi, sprinkle garam masala on top. 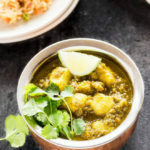 Garnish with cilantro and serve this Instant Pot Aloo Matar hot with roti or any bread of choice. 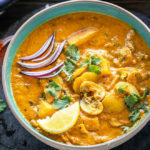 If you’ve tried this Instant Pot Aloo Matar Recipe then don’t forget to rate the recipe! You can also follow me on Facebook, Instagram, Pinterest and Twitter to see what’s latest in my kitchen! 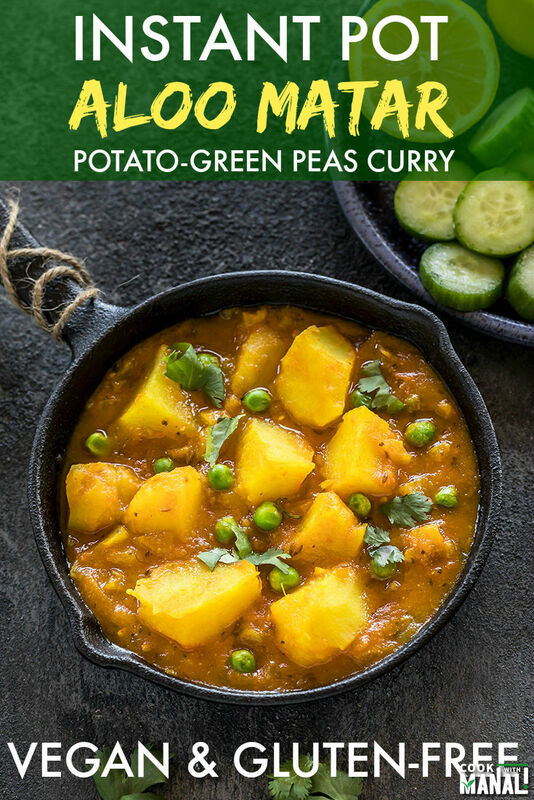 Simple Indian potato and green peas curry made in the Instant Pot! Goes well with any flatbread of choice. Vegan & gluten-free. Press the saute button on your Instant Pot. Once it displays hot, add oil to it and then add the cumin seeds and let them sizzle for few seconds. Add the chopped onion and saute for 2 to 3 minutes until the onions are soft. Stir in the pureed tomatoes to the pot and mix. Cover the pot with a glass lid and cook the tomatoes for 3 to 4 minutes. Add coriander powder, turmeric powder, red chili powder and salt. Mix well and cook the spices for 30 seconds. Add water and then add the diced potatoes and frozen green peas. Stir and close the pot with its lid. Press the manual or pressure cook button and cook on high pressure for 2 minutes, with the pressure valve in the sealing position. Do a quick pressure release. Open the pot, add crushed kasuri methi, sprinkle garam masala on top. 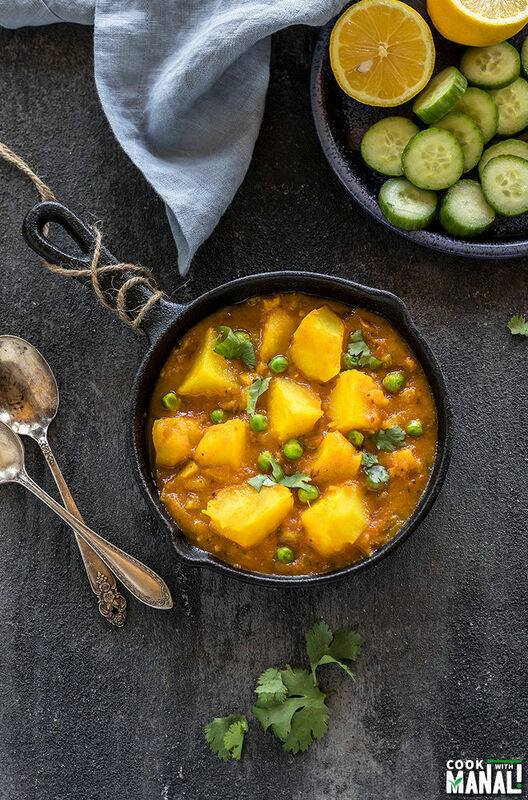 Garnish with cilantro and serve aloo matar with any flatbread of choice. Such a comforting and delicious dish! Glad you liked it Diana. Veggie broth is never really used in Indian cooking traditionally but of course its up to you. And yes you can always increase the spices as per your taste. Is there a substitute for kasuri methi, or what grocery store can I find it in? no substitute, you may skip it. And u can find it at any Indian grocery store. Is there any mobile app of yours. Just made it!! It tastes delicious. I added more kasuri methi because I am just obsessed with it. Very nice recipe – will make again and try one more from your site. there can never be too much kasuri methi, right? 😉 Glad you enjoyed it Lina! Welcome Alice! so happy you all enjoyed it! Welcome! so glad you enjoyed it! Just tried it. Turned delicious. I also.ground onions to a paste for richer gravy.